Successfully Added LED Projector with TV - 800x600, 2000 Lumens, 500:1 to your Shopping Cart. 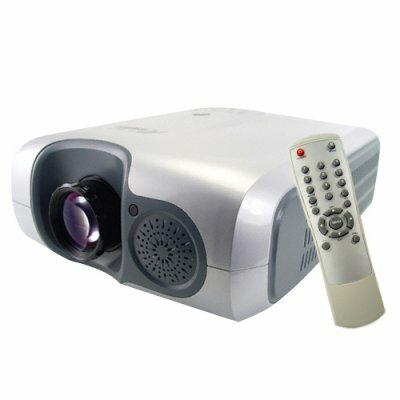 LCD Multimedia Projector for either productivity (teaching, meetings, etc.) or entertainment uses. The simple to use projector has multiple video input options and projects an image size up to 150 inches. Often used in classrooms, hotel conference centers, or living rooms, LCD projectors are also suited well for office presentations when large, crisp images will be shown, and a great way to get big screen sizes without the need for the dedicated floorspace. This LCD multi media projector is perfect either for the resale market, OEM market, or personal/company use. Brought to you from your source for wholesale direct from China electronic products, Chinavasion. LCD Multimedia Projector for productivity or entertainment. This projector is for use with 200-240V power supplies. Often called the Chinavasion "Big screen projector", "Classroom video projector", or "Laptop display projector" in the press. This looks pretty good and would have been a best buy provided it also had a 110v..
What can I say, I have the projector set up in a room just for watching DVDs. The picture is best with the room darkened, but I can still see the picture when I have the lights on. It doesn't have all the ajustments of my bigger more expensive brand name projector, but then, thats sitting in the shed because I couldn't afford to buy a replacement bulb. I bought this projector and 2 spare bulbs for less than the price I would have had to pay for the brand name bulb alone. This is a great projector, although some people may want more picture control, this keeps things simple, and you can watch even in a lit room. on 2009-05-01 14:34:07 EXCELLENT PROJECTOR! I love this projector! Great picture and it even looks great on a plain white wall. Cant wait to put the image up on a real screen. The sound comes from a small speaker and its volume is not adjustable, BUT who wants to listen to a little ole speaker when you can hook up a sound system to it? The built in speaker is really just a monitor and not really intended for general use IMO. Personally Im going to run the sound to some wireless headphones so I can hear it clear and loud without annoying the neighbors. This projector is a great value for many reasons but the single most important reason is the LOW PRICED bulb. Other high end units have bulbs that cost upwards of 350.00 USD the bulb for this unit, 11.75 and THAT my friends makes its the best value for a video projector. Buy this, you will be amazed! THANK YOU CHINAVASION!! Xi-Xi!!! on 2009-04-14 09:50:11 My first projector and love it, was delivered on time. Worth buying. Was received on time and being my first projector won't make comments until I use it heavily. on 2008-11-26 17:27:27 Good picture, but too loud. Too loud sound of cooler. It's quite annoying.